"Conversations from a Birthing Room"
writes . . . A precious baby is entering the world today. As we watch the contractions on the monitor, the birthing room fills with grandparents, aunts and uncles; everyone coming with anticipation to greet the newest member of their family. Yet, the conversation I have with my friends, the expectant parents, is quite different than any other. To understand, you need to know more. Not long ago, friends and family gathered at this same hospital to welcome Kade - see sweet Kade on the left. Last summer, on August 28th, Kade entered this world. Sadly on October 28th, at just two months of age, Kade slipped into eternity in his sleep – cause of death: SIDS. His parents have deep faith in God, and continue to trust Him with this loss. All the same, their faith does not lessen their sorrow. They still grieve . . . they grieve with hope – a hope of that blessed reunion when they will hold dear sweet Kade once again. Just before Christmas, my dear friend discovered she was expecting again. In fact, she was already about 10 weeks along. Calculations indicate that she actually conceived this baby the week before Kade’s death. These questions of “why” – so much a part of one’s grief journey – often do not have an answer. They are questions that express our deepest longing for understanding, for meaning, for some way of knowing – "How do I go on living with this tremendous burden of loss?" , Jesus utters his prayers of protest, that his life will be crushed under the burden of sin. There Jesus climbs into the lap of Abba Father and pleads for this cup of death to pass from him. In fact, three times Jesus brings his pain to God, and then finally rests in submission to the Father’s plan – a plan that will glorify God and draw people to Him. Today is not a redemptive moment because there is another birth in the family. Today does not redeem the loss of precious Kade. No, the Redemptive Steps came months ago. 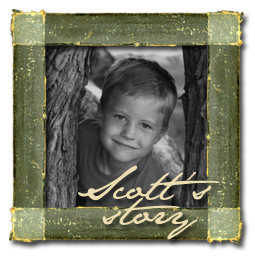 When Kade died, there was the potential for his parents to be destroyed by his loss. But they are choosing daily to be transformed by it. By God’s grace and mercy, Kade’s parents choose to rest in the everlasting arms of God, to trust Him with this loss and in the process, their lives glorify God and draw others to His Kingdom. Post Script: At approximately 3:30 pm this afternoon, Kade’s little sister, Tori Ann, came into this world.